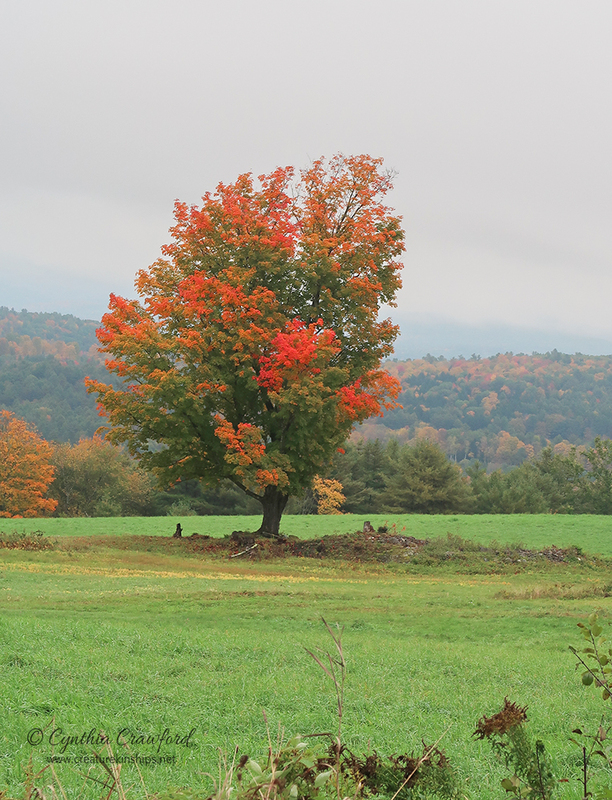 Colors are not quite peak in my part of Vermont, but the tree in this farm field is halfway there. A foggy morning. Gorgeous color in this tree, Cindy. And it appears that the trees in the background are beginning to change too. Are those little critters under the tree? Yes, the trees are gradually turning, but lately it's been hot here-70+ degrees. Strange...(or the new normal?). Not tree turning weather. No critters under the tree that I know of, though a squirrel would not be surprising- we are having "squirrel-mageddon here. Glad to see some color in the tree. I like the fog. Interesting, this tree seem to go from green straight to red, without the customary yellow in between. I am planning a trip to Vermont, New Hampshire and Maine (the last three I have never visited) in late September of next year. I chose that time to catch the early fall colors. Would that be too early? Late September is probably a time when things will be variable- further north you might hit close to peak foliage- perhaps, for instance , in the White Mountains in N.H. I live in central Vt and we have not hit peak foliage yet. We may not, either-it's been a strange year. You can see that in the maple tree- they are changing earlier than the other trees for the past few years, and some have gone straight to brown. That said, I'm sure you'll see much beauty wherever you go, whenever you go. There are a lot of foliage tracking sites out there. I had the same thoughts! Looks like a couple of prairie dog type animals. Then I thought they were maybe little fence or tree stumps. Isn't it great to have the seasons, and beautiful colours like this! This year is so messed up with the summer heatwave and drought, I don't know if this autumn will be much at all. We had temperatures of 75 degrees F. today - crazy for October. I never thought I would be wanting it to turn colder, but this year I am. I love the colors Cindy! What a beauty. Please post some more shots when the tree get full red like it is on fire. Thanks Ludo. I saw it yesterday but did not have a short lens. Strangely, it is mostly yellow now! Will try to get another take on it. It almost seems backwards!!! I really think the fog is a great complement to the tree.